When I was doing research for this website, I discovered that a lot of people were actually searching quite a lot for the phrase "soccer ball pictures". It surprised me a bit. Why would they do that? I thought everybody knew what a soccer ball looked like. But maybe I am wrong. And hey, if you want so see a picture of a soccer ball, then you shall get a picture of a soccer ball! The brand is Select. 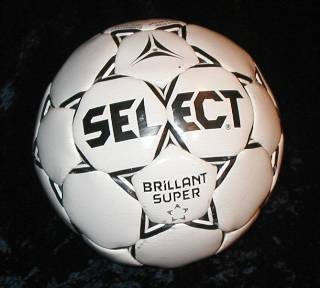 I have always preferred Select soccer balls. And I have never been disappointed with one. They are of the very best quality. There will be a whole range of different brands of soccer balls.